In late May 2015, articles, blogs, and newsfeed buzz quickly spread word about the French legislation freshly adopted by the National Assembly on the reported obligation for supermarkets to donate edible and unsold food to relevant charitable organisations. Acting quickly on this widespread awareness about food waste measures, Arash Deramarsh, the municipal councillor of Courbevoie (France), launched the online petition “STOP Food Waste in Europe” in 7 different countries. On 9 July, with over a half a million signatures and a formal proposal from French Member of European Parliament and active food waste activist, Angélique Delahaye, this food waste amendment was adopted by the EU Parliament within the report, “On Resource Efficiency: Moving Towards a Circular Economy”. Following the adoption of this legislation within France and furthermore within the European Parliament’s circular economy report, FUSIONS sought to identify stakeholder reactions and assessed the status of similar food waste legislation and voluntary schemes worldwide. A deep look at the original text of the French legislation clarified several contextual points about the widely discussed food waste provisions. Each year, FUSIONS organises four Regional Platform Meetings (RPMs) and one European Platform Meeting (EPM), bringing together FUSIONS Members and other stakeholders across the food chain. This year’s third RPMs took place this spring in Oslo, Bologna, Paris and Budapest. A short summary of each meeting is provided. FUSIONS attended the No More Food to Waste conference in The Hague in June! FUSIONS attended the Global Conference NO MORE FOOD TO WASTE – Global action to stop food losses and food waste in The Hague, The Netherlands. The conference was held from 16 to 19 June 2015 and brought together 325 participants from around 60 countries. FUSIONS coordinators WUR participated as speakers in several sessions. FUSIONS Partner BIO by Deloitte presented the Food Waste Quantification Manual to be released this fall. In the meantime, a downloadable file is available to the Chair’s Summary Report, containing all of the conference’s conclusions! FUSIONS supports the Food Surplus Entrepreneurs Network (FSE), a network facilitating the exchange and collaboration between entrepreneurs using or reducing food surplus. The FSE Network has expanded very fast in the past few months around Europe. FSE now has hubs in Paris, Brussels, London, Berlin and Amsterdam. They have recently organised “The Food Waste Collab”, back-to-back with the FUSIONS RPM in Paris, and pitched their ideas to global leaders at the “No More Food to Waste Conference” in the Hague. Selina Juul awarded with Roskilde Festival Environment Award 2015! Selina Juul (Stop Wasting Food movement Denmark – Stop Spild Af Mad) and Peter Hauge Lund (The Round Table – Det Runde Bord) were awarded with Roskilde Festival Environment Award 2015. Last year, the two associations collected 27.500 kg of food surplus during the Roskilde Festival. Three other environmental initiatives were also nominated for the award. The food waste revolution arrived at Budapest, where a coalition of 12 organisations came together to celebrate delicious solutions to food waste. 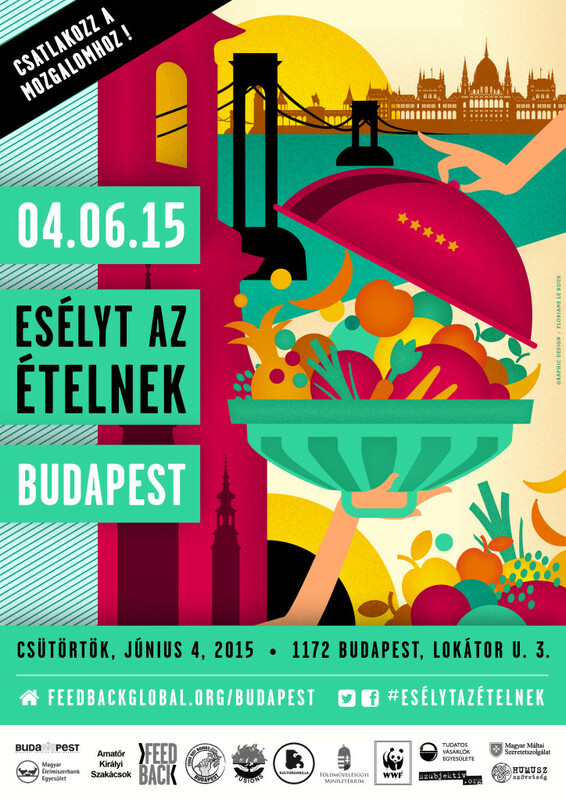 Give Food a Chance (Esélyt az Ételnek Nap Budapest) took place on the eve of World Environment Day and aimed to highlight the fact that 99% of surplus food is currently wasted in Hungary. On Wednesday 4th of June, a massive Disco chopping event facilitated cooking 5000 delicious lunches, showing that the solutions to food waste exist and urgently need to be adopted. Volunteers chopped over one tonne of fresh vegetables that would have otherwise gone to waste. European Commission public consultation on the circular economy still open! After having withdrawn the Circular Economy Package last December, the Commission aims to present a new, more ambitious circular economy strategy in late 2015, addressing a range of economic sectors, including waste. The strategy will be fully aligned with the priorities of the new Commission. This package will comprise a revised legislative proposal on waste and a Communication setting out an action plan on the Circular Economy Package for the rest of this Commission’s term of office. As part of the process, the Commission is launching a public consultation on the subject from the 28th May until the 20th August 2015.